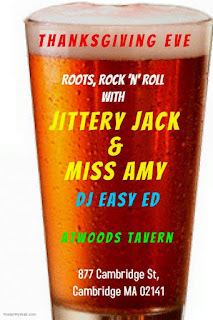 The Songs from Last Night's Show/Thanksgiving Eve Party at Atwood's Tavern with Jittery Jack! Thanks for tuning in to last night's show. If you missed it, the archive MP3 will be available for free download from easy-ed.net and iTunes in just a few days. See below for a list of what we played. 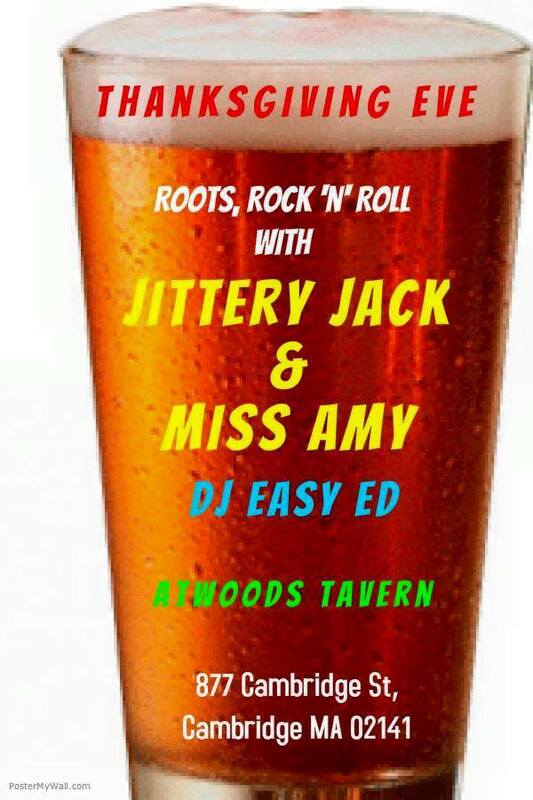 Come down to Atwood's Tavern this coming Wednesday for our big Thanksgiving Eve party with Jittery Jack and Easy Ed's Record Hop! I hope you all have a great holiday next week. Here’s what we played on last night’s show (November 20). from Louis Jordan: Let The Good Times Roll (1938-1954) (Bear Family Bear Family Records) —Happy birthday, Poison Ivy! If you're reading this, and you celebrate Thanksgiving, I send my best wishes to you, your friends, and your families. It's a wonderful holiday--my favorite, in fact. I hope you have time off from your labors to relax, reflect, and enjoy for a few days. As the fine print states, the great Jittery Jack will play a show Thanksgiving Eve at Atwood's Tavern in Cambridge. He's asked me to bring the mobile version of my show, "Easy Ed's Record Hop," along, so I'll be spinning 45s for you that night. Jittery Jack is a dynamic, world-class performer who really knows how to entertain a crowd. This event at Atwood's isn't just for the greasy rockers, folks. Jittery Jack appeals to a wide array of music fans, and he's got a top-notch band backing him: Miss Amy on guitar, Johnny Sciascia on bass, and Judd Williams on traps. (BTW, he hosts a talk show on youtube. See his page for info. It's a fun watch.) We hope to see you at Atwood's. 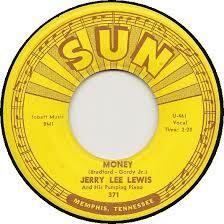 I tip my hat to small, independent record labels that put out vinyl 45s. That format is the weapon of choice for many live DJs, including me. 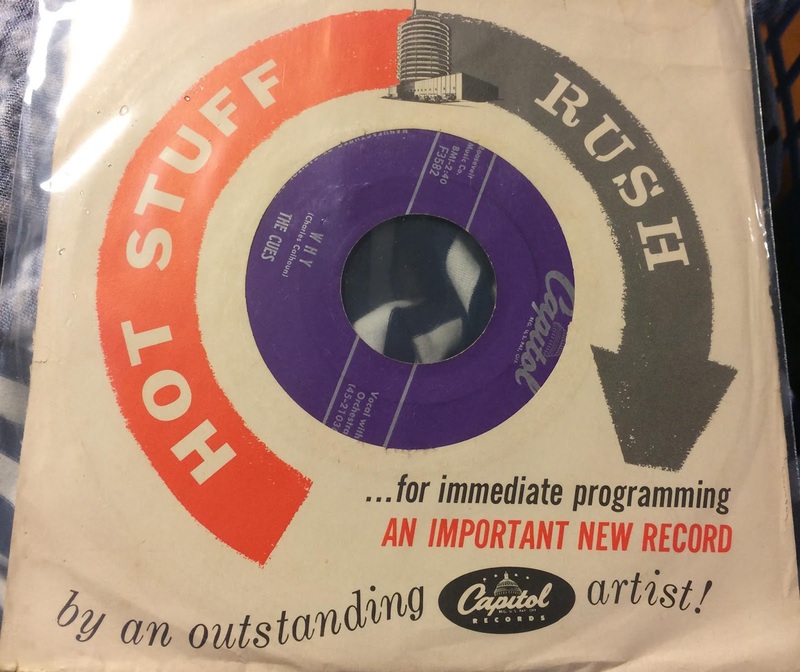 These labels face steep challenges: Find great acts to record, get them to the studio, then jump into the highly competitive world of record pressing. Record plants are few; they can't keep up with demand these days. It can take a loooong time to get your records. So, big kudos to Rockin' Records in Vancouver. They are dealing with all the headaches and getting things done right. I really dig their latest release, "Not Guilty" by The Margraves. 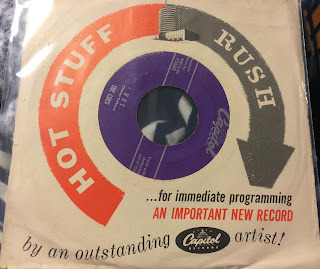 If you're a fan of rockin' 45s, check out Rockin' Records. That's all for now! Happy Thanksgiving! I'm a Fanatic IV Fan! 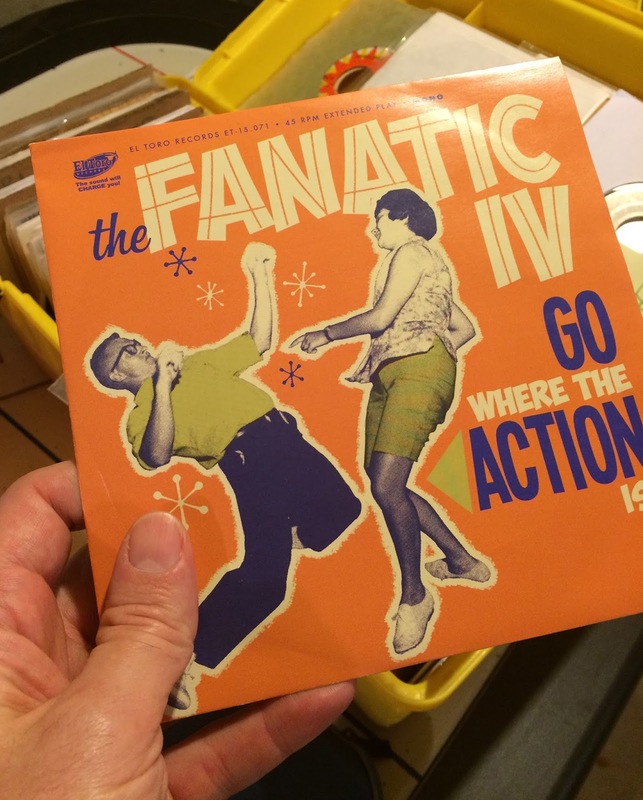 The Fanatic IV from Helsinki caught my ear a few months back with a preview track from "Go Where the Action Is!," a 4-song EP on the El Toro label. This record has taken up permanent residence next to Deck 1 in my record room, except when traveling around in the "Gotta Spin NOW" box I bring to DJ gigs. This is straight ahead rock 'n' roll sung and played by guys who know exactly what they're doing. But it's also more than that. You don't make a record like this by dabbling in a genre for ten minutes before rolling tape. A lifetime of rock 'n' roll is wrapped in this small orange package. About the format: Although the Fanatic IV most definitely have the firepower to deliver a full LP/CD--I expect that's already in the works--the four-song EP packs a solid punch. The term "all killer--no filler" would not be misapplied here. More bands should do the short form. Bash four scorchers down and blast your best sounds around the world. Make that three scorchers and one moody burner, a twist-era cover of Hank Williams' "Ramblin' Man." You're right to be skeptical, but the results are infectious. (This band could get the Statue of Liberty out on the dance floor.) There are two originals on the disc--including the title track, which I've found fits perfectly between Lelan Rogers' "Hold It" and "Las Vegas Scene" (Wes Dakus) in a live set--and another cover, Bobby Darin's "Irresistible You." Here's how The Fanatic IV summarized their sound on Facebook: "Imagine frat rock at its moronic peak in ’63 mixed with heartfelt teen ballads done by the last of the greasers in the time when blond Fender Amps were the loudest thing in town and everybody was doing the twist." Nicely said, and, sure, it is all that. But they're holding back more than a little bit. 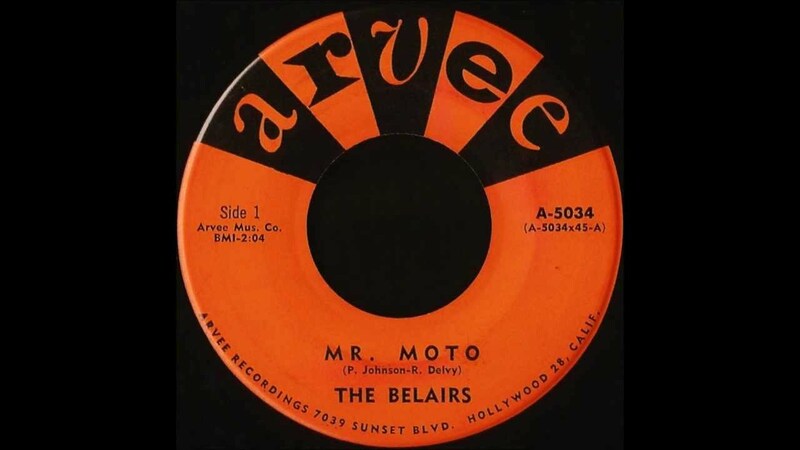 This is a very special little record. I've gotten some flak/questions about not promoting many band/DJ shows in the last few months. That may change in 2016. I sure want to do it, but the time just isn't available at the moment. 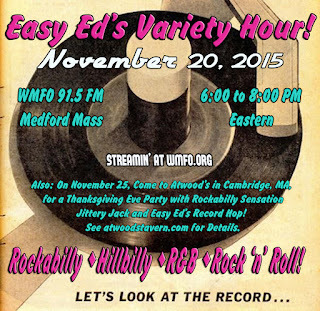 For now, in addition to the radio show, I've been putting a lot into various DJ nights in the Boston area. In addition to our twice-monthly Primitive Sounds night at River Gods, P.J. 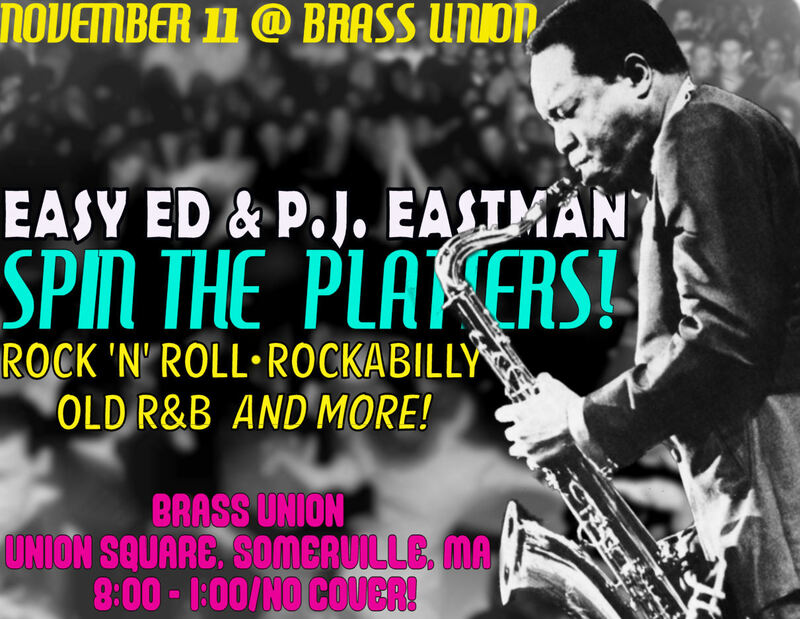 Eastman and I spin together once a month at Brass Union in Somerville, MA. The next one is coming up this Wednesday. 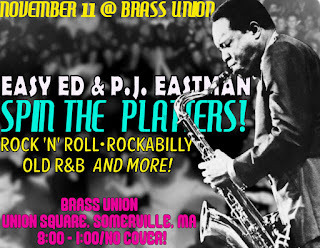 This is a blog post, not an ad, but I do hope you check out our night sometime as P.J. and I put a lot into it. Brass Union is a fun place, with a good draft beer/wine/cocktail selection. They've got room to dance, games (e.g., shuffleboard), and a top-notch sound system. And we play records. Lots of records! The night goes from 8:00 to 1:00. 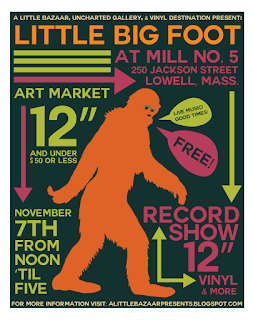 This month's Brass Union is by Alex F.
Yesterday afternoon I drove up to Lowell, MA, to check out the record show at Mill No. 5. I like that city--hadn't been there in a while--and the event poster (above) was eye-catching. If you haven't been to Lowell it may seem a bit gritty and worn on the surface, but the history of the place is fascinating and I find the people to be friendly (in a New England sorta way). In Boston a lot of cool old stuff gets torn down and replaced with new stuff that tries to be cool and look old. Lowell tends to leave things as they were. Mill No. 5, however--as the name suggests--is an old mill building that's being renovated as retail space. 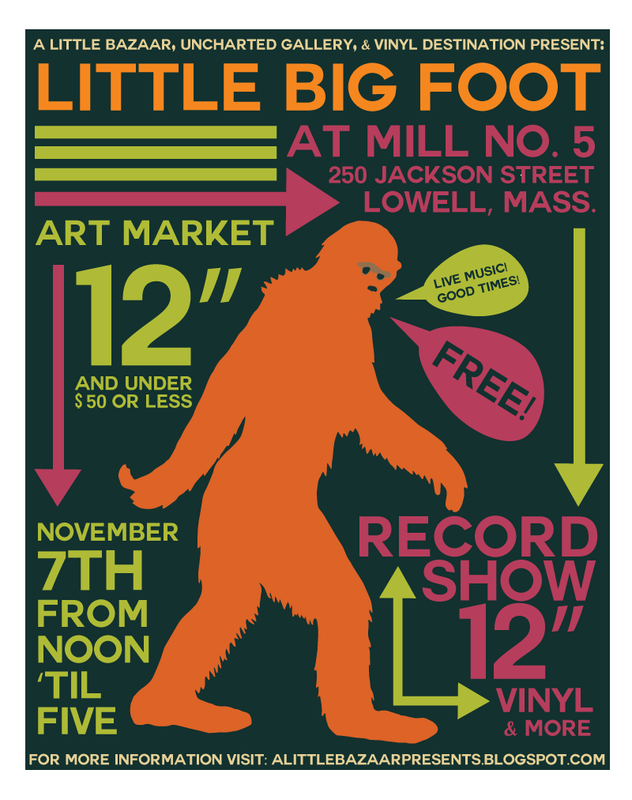 For yesterday's show, on the building's fourth floor, art and craft vendors, record-dealer tables, and a DJ were set up. They had a healthy crowd, but the dealers mostly had LPs and I was after singles. 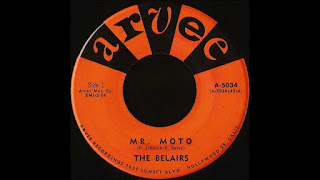 Strange thing: A few of the records I bought had a name-and-address sticker on the them, and the name was familiar. I Googled the guy and learned that it was who I thought it might be, a former day-job colleague from many years ago. He died in 2014, and someone must've sold off his records. He and I never discussed music at work, but I see now that we should have since we apparently had similar taste. It feels eerie to own records of a dead person you used to know, but they are in good hands and will be enjoyed. He'd probably be happy to know that. This of course leads to the inevitable question: What will happen to all my records after I hand in my lunch pail? I guess someone else will need to worry about that. OK. Enough morbidity. Time to go play some more of the newly acquired finds. This summer I was hired to DJ at an out-of-town, day/evening gig. It was a little like DJing a wedding. I didn't know many people there and wasn't sure what the crowd would want to hear. But it was my job to entertain them, and I did. 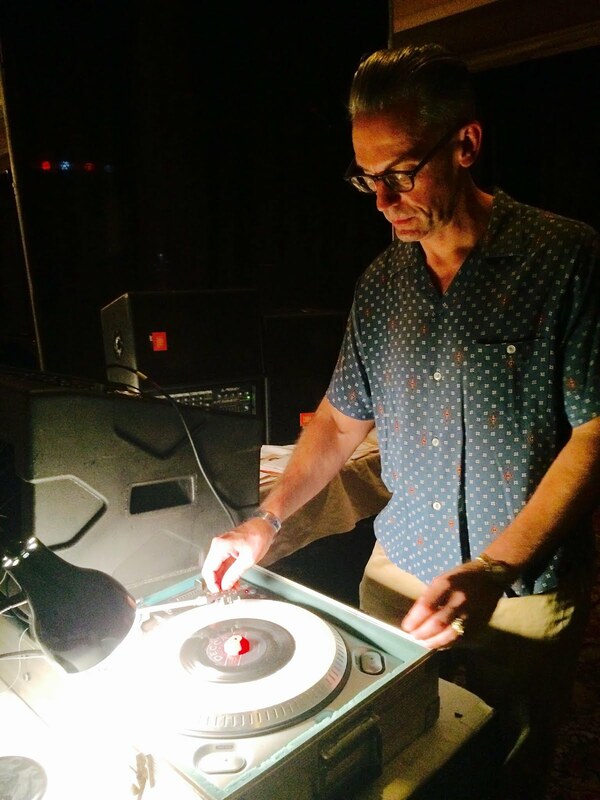 I brought tons of 45s with me that day and ended up playing fairly well known stuff (well known to me anyway). Some of these records I play at regular club shows close to home (Boston/Cambridge), but most don't see daylight too often because I always think everyone's heard them too much already. But for an event like this you need to try to read the crowd and give them what they like (e.g., stuff they know or stuff that sounds like other records they know). Here, preserved in digital amber, are my sets from that day. It's kinda interesting to me to read through it again now. (I'm a bigger Ricky Nelson fan that even I knew.) Maybe it will be interesting to you also. Some of these are requests. Most of the records are originals, although I do spin repros when necessary. The event went from early afternoon--a hot, sunny day--until late at night, and there were several band sets interspersed with the DJ sets.